I have a problem with the pdf files that I generate from exporting my Scribus files. I can't use the search function in the pdf file as when I enter a word that I know for certain is in the pdf file the result comes out as "no word was found". Why is that? Can anyone help? I have attached a pdf file. It looks like you have outlined the font rather than embedding it. When a font is outlined, the glyphs are converted to curves - like vector art - and cannot be searched as they are no longer text, they just look like text. Have a look in the "Fonts" tab of the "Export to PDF" dialog under "Fonts to Outline". Select the font and press the "Up" arrow to move the font to the "Fonts to Embed" list. If Scribus won't let you move it then you either have to accept that you can't embed it or change to a font where you can. THANK YOU SO MUCH, Garry. My font was Palatino which Scribus wouldn't embed but then I changed it to Garamond which it would embed and now I can search and find words in the pdf-file. Again - THANK YOU SO MUCH. It warms my heart that people like you exist. You're very welcome. I'm glad to be of assistance. I have the same problem and was trying to solve this with help of the existing threads, but unfortunately it doesn't work. A PDF export with a blank document works (with search function). But in my main document the search function doesn't work. I've embedded all fonts (I mainly use Google Open Source Lato Font). I already searched for embedding restrictions, but there are none (https://www.fontsquirrel.com/license/lato). First I could not embed LATO, so I deactivated "subset" in Fonts. Have you checked which fonts are actually embedded in the PDF, rather than what Scribus says it is going to embed? The two things are not always the same. Most decent PDF viewers will let you see the font list somehow but it depends on the application (usually File -> Properties, or something like that). If you have all of the correct settings for embedding - which you seem to have - and Scribus doesn't embed the font there's usually not much you can do about it. It sometimes doesn't embed fonts for a reason but it won't tell you what that reason was. I've just downloaded the Lato font family from Font Squirrel and installed it onto Windows 10. A quick look at the Fonts folder shows me that, for example Lato Bold: Font Embeddability is Installable. I created a new document using three variants - regular, bold, and light-italic - but Scribus 1.4.6 isn't letting me embed them. 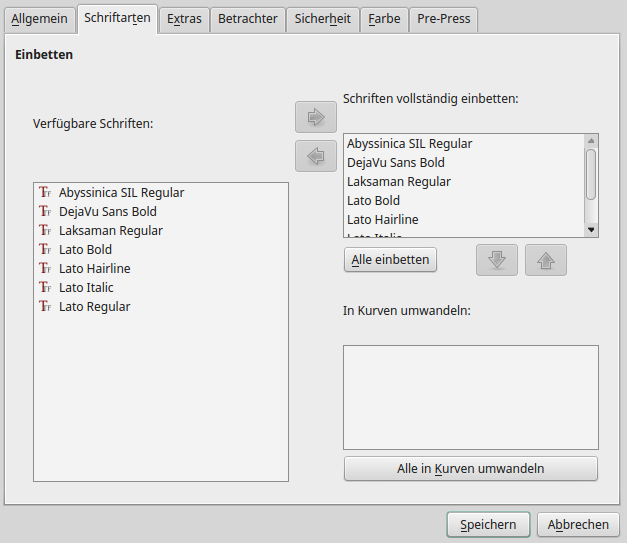 This tells me that there's probably something about those fonts that Scribus doesn't like. Unfortunately there's probably nothing you can do about this. If Scribus won't embed the font then it can't be embedded. P.S. I have no idea if changing the Subset check-box value has any effect but I'm personally not willing to try in case I cause other problems. thank you for your effort gary!! I contacted the lato font crew, maybe they have a solution for this issue.